If you need convincing that there’s more room to move in the suburbs then new Greensborough cafe Mabel Jones is a shining example. The place is like a tardis – small on the outside and big on the inside. Enter through the deceptively skinny corner shopfront. A coffee nook of soft tan leather booths flanks a pram­-friendly ramp up to a split-level, pram-­friendly dining room (there’s more space between the tables than your average supermarket aisle). Out back it’s all exposed bricks and piping, floor-to-ceiling windows, aqua­-mint blue trim, a long communal for 20 and stacks of banquette seating. The owners of Jerry Joy, Thornbury, welcome to the family Mabel Jones. Set amongst the lush, green landscape of Greensborough, the space offers a full dining experience, from quick take-away coffee & bites, to long lunches with a full a la carte menu and a delicious range of drinks. Mabel Jones’ pram-friendly dining room. Top-notch brunch dishes come from a small open kitchen care of head chef Sandra Melgalvis. Her crew plate up responsibly ­sized, pimped-up portions: a disc­-shaped hash brown with ham hock terrine, poached egg and cider hollandaise has a decent chunk of crackling; house-made crumpets (square!) come with mandarin-infused whipped cream, sticky marshmallow and a chocolate crumb. 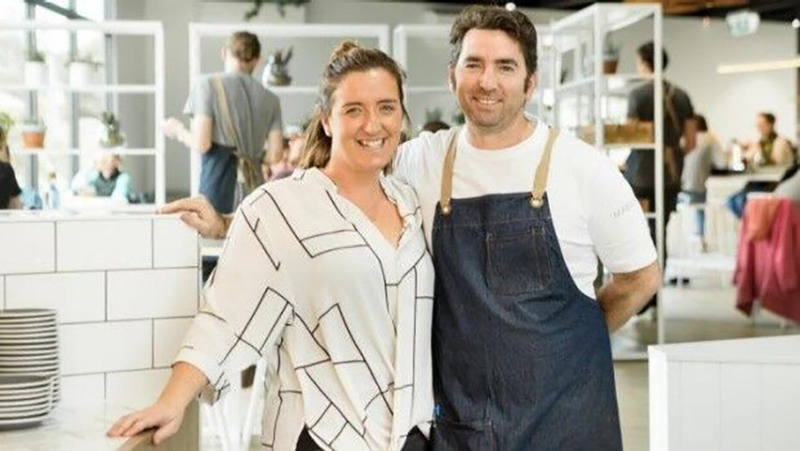 Mabel Jones might only be a new business in Greensborough but this is the third rodeo for owner-operators Seona and Damien Breen – they’ve also got cafe Jerry Joy in Thornbury and they ran Food Drinkery in Burwood, back in the day. Expect more developments as they settle in. It’s Axil coffee through an espresso machine now but we’re told filter is on the way and, fingers crossed, a liquor licence and evening trade soon.